Promotional Frisbees and other Promotional Flyers are great products to get your brand out there and flying around! Printed Soft Flexi Frisbees, Branded Foam Guns and Customized Mini Flyer Zoomers are fantastic and safe products for children to play with without getting hurt. Vivid Promos has a large range of aerodynamic Flying Frisbees with large branding areas, Coloured Plastic Frisbees, Eco Friendly Frisbees made from recycled materials for the environmentally conscious buyer, Pop Up Polyester Folding Flyers with your choice of branding, Plastic Boomerangs, custom printed Kites, Stress Shuttles, Donut Flyers and Tripod Flyers are all available in various bright colours to suit your business. 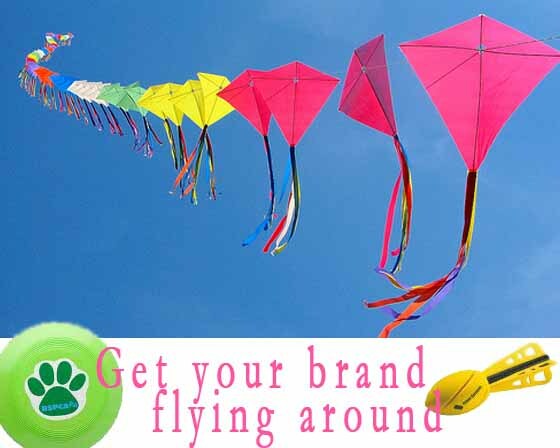 Fun and Novelty Flyers are always a winner for not only your company but also your budget, you don’t need to spend a fortune to get your Brand name out there with our Promotional Frisbees, Flying Disks and Foam Shooters. Made from Heavy Duty PP our Flying Frisbees will last a lifetime and are great value for money. Custom Printed Promotional Flyers are an ideal promo product for Schools, Governments, Councils and Health Companies wanting to promote a healthy and active lifestyle by getting outside, getting active and having fun!